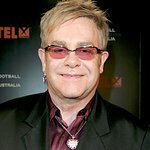 Sir Elton John has given hope to aspiring singers everywhere by being crowned Karaoke King in a recent charity auction. The event, held at Ronnie Scott’s Jazz Club in London on June 21, raised funds for the Hoping Foundation, a non-profit organization that assists children in Palestinian refugee camps. Bidders at the auction were able to “buy” their favourite singer to perform a song of their choice, or in some cases to perform a duet with them. Sir Elton gave his rendition of the Elvis Presley tune “Are You Lonesome Tonight” in front of an audience that included Kate Moss and Elle Macpherson. His talents were bought by Elizabeth Hurley for $200,000 as a birthday gift to herself. Other popular choices included Australian-born singer Nick Cave, well known for his dark songs, who raised $150,000 by singing Destiny Child’s “Bootylicious”, and Pogues frontman Shane MacGowan, who performed Billy Joel’s “We Didn’t Start The Fire” for $60,000. Bryan Adams shook the building to its foundations with his version of “Rocking All Over The World”, and James Blunt serenaded the audience with his gentle tones on “Summertime”. A total of $700,000 was raised during the evening, much of which will go towards providing university scholarships in Lebanon, as well as emergency relief for Palestinian families forced to flee their camps at Nahr Al-Bared during recent fighting.